1. 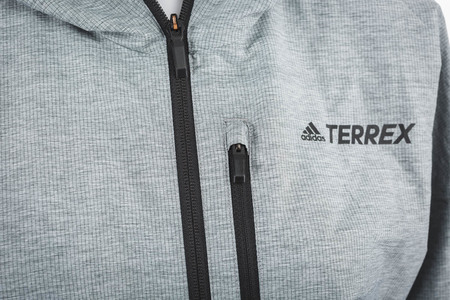 Through a sophisticated arrangement of density and the use of different denier of yarns, we achieved a true innovative woven fabric that has a real differential air permeability which provides wind resistance and breathability at the places where needed in one piece of fabric. 2. The material maintains aesthetical look which indicates the actual function. 3. Dark heather area has A/P about 3 cfm and light heather area is about 20 cfm. 4. "Breathable" area is placed according to the sports science. Human body needs more breathability at lower front body and higher back body. 5. 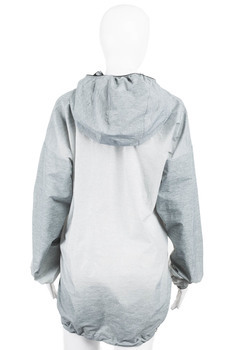 Daringly simple design to reduce unnecessary cut lines to achieve an ultra lightweight packable wind jacket. Windproof jackets are normally made of a material with the same weight throughout. 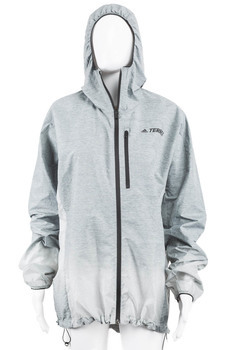 The Terrex Agravic Windweave Jacket is different. Its sophisticated engineered fabric has different density yarns woven at different sections for greater breathability or windproofing according to body mapping.